The Rural Water Supply Network Forum is one of the major global events on rural water services and takes place every 5 years. Organizers anticipate 650 participants from all over the world at the 2016 event which will take place in Abidjan, Côte d’Ivoire. This year, the theme of the Forum will be “Water for everyone”. Registration and call for submissions is now opened! Further information and updates can be found on the Swiss Water Partnership international events page. At the Stockholm World Water Week 2015, several members of the Swiss Water Partnership (HELVETAS Swiss Intercooperation, iDE and Eawag-Sandec) joined hands to organize an event on how to improve organisational learning and sharing of learning from errors. The event was highly successful, as shown by this blog post by Susan Davis, executive director of Improve International. In the light of this success, several Swiss Water Partnership members jointly submitted a proposal to SIWI for the Stockholm World Water Week 2016 in order to follow up on this event under the title: “Turning errors into actions: Continuous Improvements!”. Based on last year’s outcomes, discussions in 2016 would focus on concrete experiences and formulate recommendations on how to turn monitoring results – successes or failures – into learning and actions. Should the proposal be accepted, Improve International would of course be part of the journey. 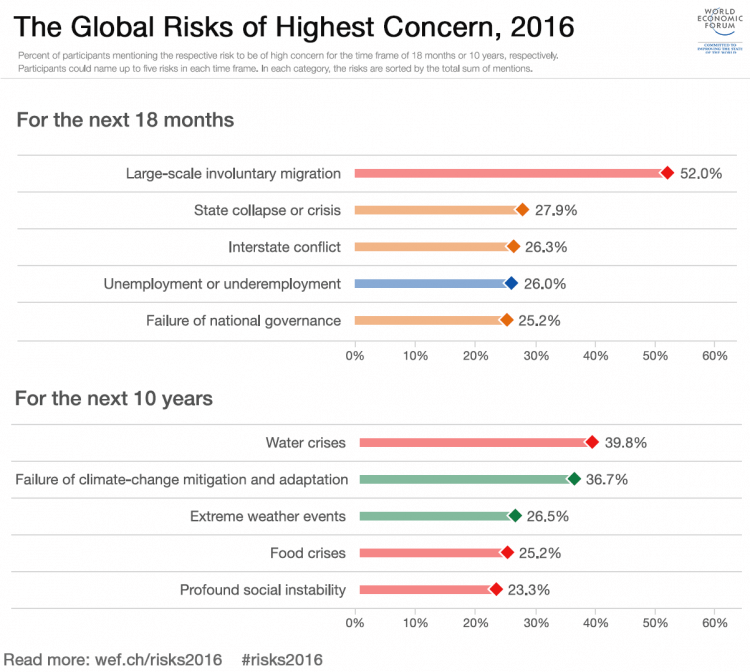 This year’s Global Risk Report of the World Economic Forum saw water emerge as the risk of highest concern for the next ten years, while water continues to figure as the top 3 risk in terms of impact. In addition, water and climate change were identified as a main “cascading risk” with a call to improve water governance to better adapt to climate change as well as increasing economic and demographic growth. The report relies on the Global Risk Perception Survey which is conducted yearly with World Economic Forum’s stakeholders. 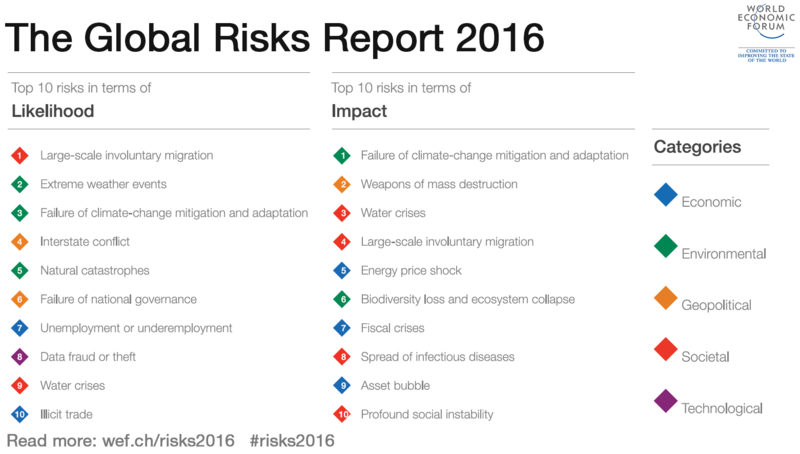 This year, 750 experts, from various sectors and backgrounds, assessed 29 separate global risks for both impact and likelihood over a 10-year time horizon. 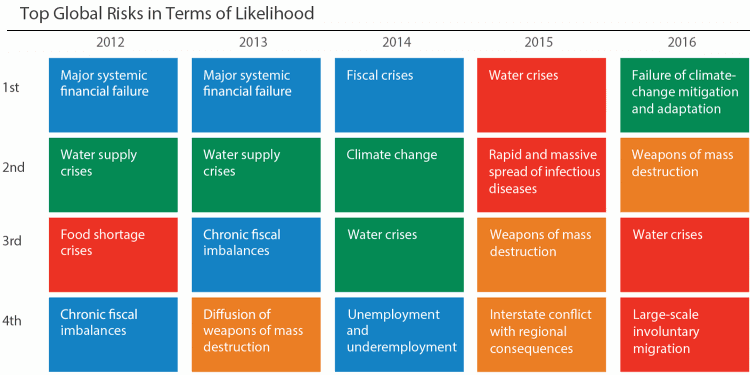 Water, categorised as a societal risk, is seen of high concern both in terms of likelihood (9th) and impact (3rd). This has been the case since 2012, with water being ranked as top 3 risk in terms of impact. However, while last year the report placed water as the top risk in terms of impact, this place is now occupied by the failure of climate-change mitigation and adaptation. The survey also asked participants to rank the risk they perceive as being of high concern for the next 10 years and water crisis emerged as the top long term risk. The report recalls that “some 2.7 billion – or 40% of the world’s population – suffer water shortages for at least a month each year“, or that, according to OECD, “4 billion people could be living in water-scarce areas by 2050”. Climate-change is identified has having a high potential to exacerbate tensions around the water resource, while governance at all levels is seen as the main entry point in order to improve water management and thus mitigate this risk.